While the focus of this course is nursing theory, some nurses say that theory has no role in clinical practice. What are your thoughts? Does nursing theory have a role in clinical practice? How would you use nursing theory to improve or evaluate the quality of clinical practice? Be sure to include an example that demonstrates your thoughts. Don’t forget to include a scholarly reference! 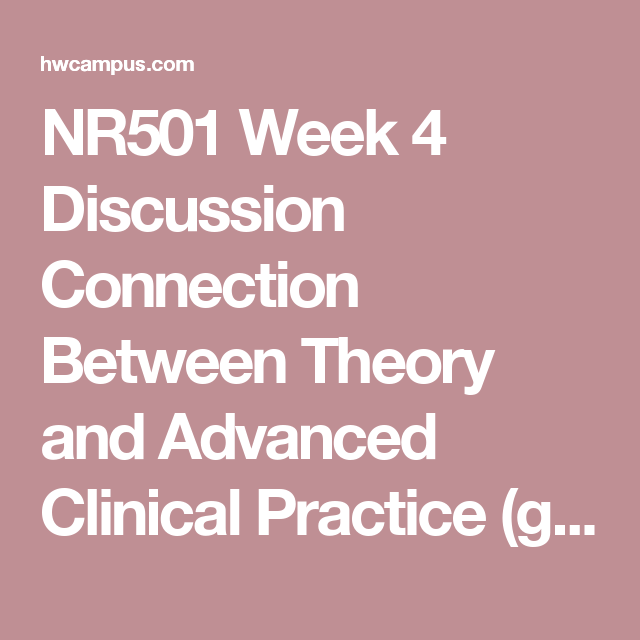 We had some healthy debate over this in the start of this class but as the weeks go by there is more and more affirmation to me on the importance of theory in clinical practice. In my opinion, nursing theory is truly instrumental in nursing and the overall profession of nursing. While things change and evolve we can’t forgot those things that got us here. Nurses must recall nursing’s roots and celebrate nursing theory for what it is and all it represents (Karnick, 2016). Nursing theory is described as a way of organizing concepts and ideas (Karnick, 2016). In my opinion, nursing theory lays a foundation and provides a framework for practice. This framework provides the basis for care in which we build off as our profession evolves. In relation to its role in clinical practice, the overall goal of a nurse is to provide the best patient care and outcomes we can for those that we serve through that of theory and evidence-based practice. Applying theory to our delivery of care only helps to deliver on that goal. As nursing curriculum has evolved so has the need for categorizing that knowledge into what we know as theories to help nursing evaluate the complexities of the patient population and the variations in those populations. Theory provides nursing with principles to evaluate patient care, giving the nurse rationale for making decisions which encourages nursing to ask more broadly about the theory or evidence that supports practice (Davidson, 2012). This is turn allows for evaluation of the quality of care. The role and value of theory in quality improvement has been seriously underrecognized in healthcare (Davidoff, Dixon-Woods, Leviton, & Michie, 2015). You first must identify which theory aligns with what quality or experience metric you are wanting to look at. Quality of care is measurable with HCAHPS and with the quality data that is captured and reported publicly. Quality data is summed up with the Leapfrog Hospital Grades data that is put out for all to see in the spring and fall of each year. Those scores allow for celebration of those things done well as well as those things that need improving. Theory also provides us concepts to analyze as part of those theories and some of those concepts are measurable as well. An example is the concept of pain. Pain is rated on the HCAHPS survey and a score is provided on how well pain is being managed. Leader rounds is also a great way to capture how theory is being used on the unit as well as the impact it is making on quality. Leader rounding will only help staff look at you as a more approachable leader and that type of leadership is critical to gathering information held by your front-line staff (Lindsey & Corkran, 2012). Leader rounding on staff and leader rounding on patients is proven to make significant impacts on unit culture, morale, happiness and engagement of staff, and ultimately patient satisfaction and exceptional outcomes. One example of a theory is grounded theory. Grounded theory was used with moral reckoning to improve the quality of care they provided. The premise is that if nurses are aware of the potential reckoning in advance, they will be more likely to make consistent moral judgements and avoid situational binds and search for integrity-saving compromise in situations that test their moral judgement (Nathaniel & Andrews, 2007). This situation seeks go give nurses more control in these types of situations and helps them to understand what they are facing through explanation and by suggesting strategies to deal with uncertainty. This ultimately demonstrates the power of grounded theory to generate ideas that can make a difference to people’s lives because they are able to get to the root of the problem (Nathaniel & Andrews, 2007). I read a great article that is referenced above and I thought was a great read. It elaborated on grand, big, and small theories and the role they play for improvers of quality and researchers. I also enclosed a second link that was more specific to nursing theory and references Roger’s work. I think there is still much learning around theory and how to incorporate it into practice better. I believe as many others that the mention of theory and eyes glaze over. I believe it is because they make it more difficult than it needs to be. I can be honest in saying that I am intimidated a bit by theory just because this is something I utilize less and hope to start using more. I encourage all to read those articles below. Nursing has evolved from what use to focus on task orientation to a more thorough credentialed profession through the implementation of nursing theory tested evidenced based practices. This graduate nurse understands there is a plethora of concepts that provide the theoretical frameworks to the foundation of nursing care. With this idealism, it is impossible to repudiate the role nursing theory has in clinical practice. Awareness of theory evolution by historical nursing pioneers gave creation to the importance of its role in precipitating the practitioner’s autonomous role when applying clinical judgment and conducting initiation of patient care (Aimei, 2015). Nursing theory has an enormous impact on the standards and guidelines used in nursing care that are established through the incorporation of research based foundations. These guidelines are proven essential to improved patient outcomes through the implementation of a collective process by which quality improvement is upheld (May, Sibley, & Hunt, 2014). This graduate nurse acknowledges the importance of nursing theory to practice. Facilitation of patient care as a practitioner will be cultivated by fostering a contextualized appraisal of nursing theories that enable and explain the foundation to nursing action and provide insight to improved patient outcomes. Implementation of research based projects to evaluate proposed care guidelines will be performed to ensure patients receive best outcomes when developing plans of care. Establishing the utilization of Jean Watson’s theory of Human Caring will allow this graduate nurse to develop a trusting relationship with her patients. Fostering a caring environment for patients will improve upon the nurse patient interaction, therefore, improving on patient outcomes. Patients that have a trusting relationship with their care providers are more prone to participating in positive self-care activities. Additionally, nursing theory will be used to evaluate nursing outcomes. Working in a cardiac surgical ICU, this graduate nurse incorporates Katharine Kolcaba’s comfort theory into practice. Krinsky, Murillo, and Johnson (2014) reports allowing patients uninterrupted rest periods to promote comfort and healing. This graduate nurse intends on providing comfort to her patients so they may have a return to health and wellness. Evaluating the efficacy of this theory can be done through the use of the empirical referent cries, FLACC, or numerical pain scale. Although this is just one of the theories used in the day to day processes of caring for patients, this graduate nurse intends on using the foundations of multiple theorist into practice as it is her philosophy that theory plays a vital role in the nursing profession. When mentioning theory, it may provoke less than favorable responses from clinical nurses who recall the term being used in nursing school, but the term has no relative impression on how they see their nursing practice today (Jacobson, 2017). Forging ahead, it is important for nurses to understand the definition of nursing theory and to apply it in practice. For theory to make sense, it in everyday nursing activities, it must be understood. Jacobson (2017) explains that by understanding theory and relating the connections between practice and theory, the significance of theory and its fundamental role in advancing both patient care and nursing discipline will provide opportunities for bedside nurses to identify that connection. A patient admitted to the med-surg floor had a new surgical colostomy procedure. On post-op day 1, the nurse begins discharge planning and performs colostomy care education. The nurse instructs the patient to breathe deeply, cough, and turn to prevent complications of pneumonia and to ambulate as much as tolerable. The nurse shares education on colostomy care and teaches the patient how to keep the colostomy clean and dry. The nurse notices that the patient is depressed and fears being in public and around loved ones for fear of giving off an odd smell or a leak in the colostomy bag. The nurse develops a plan with the patient to participate in the colostomy care and move ‘from bed to chair’ on day 2 post-op. On day 2, the nurse assists the patient to do the colostomy care and observes as the patient performs most of the intervention himself. After colostomy care, the patient asks the nurse if he can ambulate up and down the hospital hallway. Unlike earlier in his care, the patient was in good spirits and had a positive attitude. The patient also tells the nurse that he is ready and desires to receive family and visitors. In the previous example we can apply Sister Callista Roy’s Adaptation theory to this patient. Sister Roy’s theory states that for a person to respond in a positive way to environment changes or challenges, adaptation must occur (Jacobson, 2017). The patient demonstrated positive adaptation to a life changing event, the colostomy. Just like this example, there are many other examples of ways that theory can be used to improve a patient’s outcomes. By reflecting on our nursing activities, we can see how we can unite and incorporate nursing theory into everyday nursing practice. Aimei, M. (2015). The gap of nursing theory and nursing practice: Is it too wide to bridge? -An example from Macau. Macau Journal of Nursing, 14(1), 13-20. Krinsky, R., Murillo, I., & Johnson, J. (2014). A practical application of Katharine Kolcaba’s comfort theory to cardiac patients. Applied Nursing Research, 27(2), 147-150. May, C., Sibley, A., & Hunt, K. (2014). The nursing work of hospital-based clinical practice guideline implementation: An explanatory systematic review using Normalisation Process Theory. International Journal of Nursing Studies, 51(2), 289-299. Davidson, S. (2012). Challenging RN-BSN students to apply Orem’s theory to practice. Self-Care, Dependent Care, & Nursing, 19(1), 15-19. Karnick, P. M. (2016). Evidence-based practice and nursing theory. Nursing Science Quarterly, 29(4), 283-284. Nathaniel, A. K., & Andrews, T. (2007). How grounded theory can improve nursing care quality. Journal of Nursing Care Quality, 22(4), 350-357. Jacobson, S. (2017). Building bridges from theory to practice; Nursing theory for clinical nursing. Academy of Medical-Surgical Nurses, 26(3), 13-15.